The monster-sized solar power plant could power as many as a million homes. The massive solar energy station that is being built by China is called Delingha, and when it is complete it will cover 25 square kilometers (roughly 10 square miles) of unused ground space in the Gobi desert and is expected to generate 810 MW (megawatts) of solar power, which would not only make it the biggest solar power plant in the world, but it could produce enough energy to power a million homes. Construction began on the plant six years ago. According to National Geographic, the building of Delingha in the Gobi desert in China’s Quinghai province, began six years ago. 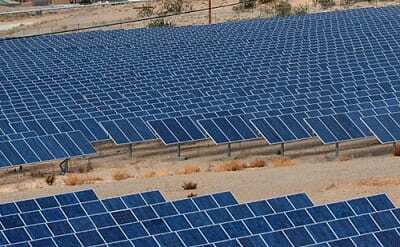 It is being jointly developed by California-based company BrightSource Energy and China’s Shanghai Electric Group. Once completed, the enormous structure will feature six huge towers and thousands of solar mirrors. Recent photographs of the solar station that were captured by NASA satellites, reveal that the solar panels now cover a region that is nearly three times larger than what was present three years back. China is fast becoming a global leader in solar energy as it works toward achieving its renewable energy goals. China has the highest greenhouse gas emissions compared to any other country in the world. However, the country is also leading the world in renewable energy, as a report from the UN Environment programme says that the country invested $83.3 billion dollars into renewable energy in 2014, which was more than any other country. China has also made incredible leaps and bounds with solar power development. According to the International Energy Agency, China produces two-thirds of all solar panels and, last year, it was the country that gained the most solar capacity in the world. Business Standard reported that between 2005 and 2014 the county boosted its solar capacity by 40,000% to 28.05 GW (gigawatts), and that the nation plans to reach 100 GW by 2020. It is expected that the Delingha solar plant will reduce standard coal use by 4.26 million tons per year and lower CO2 (carbon dioxide) emissions by 896,000 tons annually. Until the completion of China’s enormous solar energy station, presently the world’s largest solar plant is Desert Sunlight Solar Farm, which stretches across 16 square kilometers (6 square miles) of the Californian desert.